ANNAPOLIS, Md. - There are so many fun things to do when visiting Annapolis it's hard to keep count! Here are THE 5 MUST STOPS that you just can't miss when taking your own Zip Trip! LIGHT HOUSE BISTRO: Changing lives one meal at a time. Come in, enjoy a delicious meal, and give back a little - as all proceeds from this restaurant are reinvested back into the mission of Lighthouse, a homeless prevention support center. BANNEKER-DOUGLASS MUSEUM: The state of Maryland's official museum of African-American heritage! Serving to document, interpret and promote African-American history and culture through exhibits, programs and projects! THE UNITED STATES NAVAL ACADEMY: You can visit the undergraduate college of our country's naval service. There is no shortage of history or beauty here! Check out views of the water, a mock dorm room, the school's unofficial and official mascots and the academy's rich history. Light House Bistro Aims to Battle Homelessness. 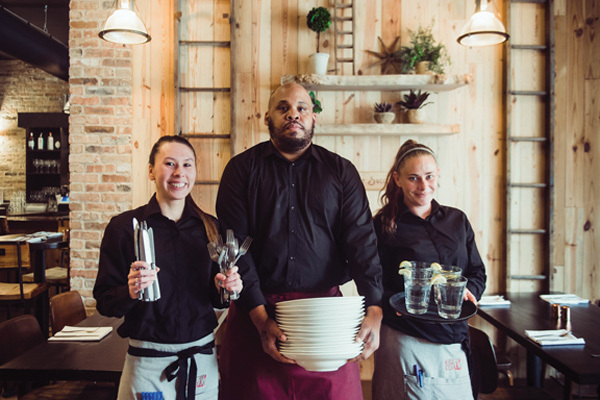 Individuals who want to help end homelessness can do so by enjoying a great meal at the new Light House Bistro that opened at 202 West Street in Annapolis’s Arts and Entertainment District on February 27. Owned and operated by the Light House Homeless Prevention Support Center and located in the Center’s one-time home, the 50-seat social enterprise restaurant and coffee bar is on a mission to provide living wage employment for individuals experiencing homelessness… Read the full article here! West Street is abuzz with excitement surrounding the opening of the Light House Bistro! This new cafe and eatery serves breakfast, lunch, and dinner, along with a grab-n-go that includes coffee and the most heavenly pastries (the trio of beignets…OMG). It is a gathering place with a mission everyone can get behind. The Light House, a Homeless Prevention Support Center, moved from their original site on West Street to a larger facility on Hudson Street, where the organization had room to expand their services to occupational training. One track offered is the culinary arts field, from which their renowned B.E.S.T. Catering services were born. Their catering quickly gained a reputation for their savory foods and attentive service, and so the idea of a Bistro formed. After years of work and a renovation at their original West Street location that started from the ground up, the Bistro opened its doors at the end of February to a warm, welcoming crowd. Long before Light House called it home, the building’s history had always been rooted in bringing the community together. The Levy Family owned and operated Levy’s Grocery Store and Capitol Drugs in the early twentieth century, where you would find people of all walks of life sitting next to each other at the soda fountain. “It brought all kinds of people together,” says Helene Sachs, whose grandmother Rebecca Levy started the grocery store in the 1930’s. Rebecca was a widow, and could be seen in the store seven days a week serving up the best quality food to support her family. “She put three children through college,” says Sachs, who still resides in Annapolis today with her family. She is shown above as a child at the store. You can also find Helene, her mother Sadie, and grandmother Rebecca on the side of the Bistro, depicted in a new piece of public art illustrated by Sally Wern Comport. The latest piece produced by ArtWalk, a 501-c3 public art initiative, pays tribute to the former store owners and other figures of Annapolis, past and present. The piece includes the President Hill street’s namesake, President & First Lady Madison, hometown hero and honorary Navy Admiral Marcellus Hall, local artists and musicians representing the surrounding Arts District, and the Bistro’s own skilled chefs. Just behind the Bistro you’ll find another piece of public art: Jeff Huntington’s take on the same Founding Father, Madison, accompanied by Teddy Roosevelt and honest Abe – a mini-Mount Rushmore for Annapolis, so to speak. Jeff brought in a team of student artists, Jovenes Artistas, to collaborate with him and his wife Julia for their public art nonprofit, Future History Now. In this cross-section of arts, history, and culture, the Light House Bistro is the perfect setting for Annapolis’s great personalities to coincide as they did all those years ago. Photography courtesy of Maryland State Archives, Helene Sachs, and Lindsay Bolin. Illustration by Lindsay Bolin. Thank you Eye On Annapolis! Light House Bistro–I want to say skip it so I can keep it all to myself…but I can’t. Go! Few restaurants hit a home run out of the gate. The new Light House Bistro did just that. I hesitate to write this review because sometimes I get selfish and just want to keep a place to myself. But the backstory is too much to not share! First off, it is not expensive. It is not cheap either, but the quality of the food belies the price. This afternoon, I had a lunch meeting there and the place was packed. The menu intriguing. I had one of the best flatbreads I have ever had (paraphrasing but…sausage, mozzarella, fennel and something else) at $14, and my dining partner for the day had a hunk of swordfish that he claimed was fantastic as well at $16. Service was very attentive all around and you could tell that everyone seemed to be empowered to make sure everyone was enjoying their meal. Our server came by often, we were visited by the general manager, and I believe the executive chef. Spot on. But even if the food was mediocre…which it is not….the selling point of the Light House Bistro is the people. Ninety percent of the people working in the restaurant have been touched by and benefitted from the Light House at some point. Some employees are graduates of their B.E.S.T. program, some employees are residents, others have received counseling and are now employed in a thriving, bustling restaurant. Maybe that is why the service was so spot on. I know for me, it is probably the biggest attraction. I know that when I spend my $15 for a lunch, I am getting a decent meal, but I also know that my patronage is helping folks that have fallen on hard times get back on their feet–and that is a great feeling. Located at 202 West Street, the Light House Bistro is a social enterprise. Social enterprises are businesses that tackle social problems, benefiting an underserved population by delivering outcomes based on a specific mission. They create revenue from selling goods and services in the open market, but they reinvest their profits back into their programs and the local community. The Light House mission is rebuilding lives in order to break the cycle of homelessness. Their Social Enterprise bottom line is providing living wage employment for those experiencing homelessness. You cannot have sustainable housing without sustainable employment. One surprise to me was that they have a full bar. Residents of the Light House are required to be clean and sober, so this was a bit of a surprise; but in keeping with their mission of providing jobs, a bar makes all the sense in the world. So yes, you can have a beer with your lunch or a drink with your dinner. The Light House Bistro opens at 7am and serves breakfast, lunch and dinner six days a week (closed on Tuesdays). You can check out their menus here. For the daily specials, you need to go and check it out. Parking is convenient–the Knighton garage is a few steps away. So my recommendation is to go. Enjoy. You will not regret it. What a welcome addition to the dining scene in Annapolis!